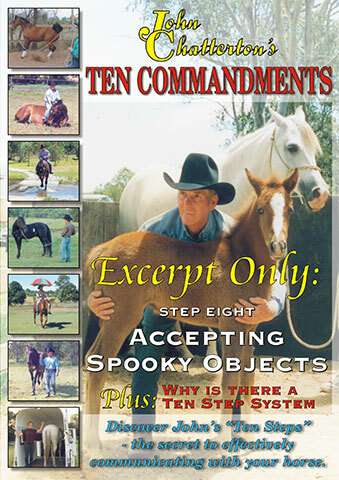 Teaching your horse to accept spooky objects reduces anxiety and prevents them shying or bolting when frightened. Step Eight, if taught in order with all the other steps, will result in a much calmer horse which will look to its owner for security. Teaching your horse to accept spooky objects helps them to control their innate flight response. A shying or bolting horse is a safety risk to both themselves and their owner/handler. The object of Step Eight, is not to get the horse used to scary objects, but to teach them that when they get a fright, they should stand still, look at the object and eventually to go to it and sniff at it. It is very important that you have worked through all the previous Steps before attempting Step Eight. It is also very important that you have control of the spooky object/s that you are going to use. ?You need to know how to place yourself in safe positions when teaching your horse this Step. One of the most important things to understand when teaching Step Eight, is that its OK for your horse to try and run away if he is frightened. He needs to make that mistake. Then you use Pull and Release to bring him back to you where he needs to learn it is comfortable to be. Soon he will stand while you move the spooky object around him, to look at it and want to inspect it. If Step Eight is taught properly from the ground, using good timing – rewarding the 1% Rule – and, effective use of Pull & Release, your horse will be much safer under saddle as well. Horses that are prone to shying will especially benefit. ?